The North Vancouver Recreation and Culture Commission is committed to providing inclusive leisure opportunities for all members of the community. If you or your child require some additional support to access North Vancouver Recreation & Culture facilities,we will do our best to find a volunteer that would be a good fit for you or your child. Our volunteers are not trained in working 1:1 with individuals and are intended to provide a minimum level of support much like a friend would be able to provide. 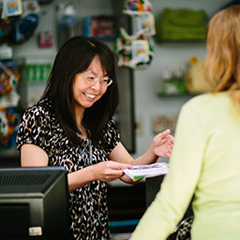 One to one in a registered program – A volunteer can assist a person on a regular basis in a North Vancouver Recreation & Culture course/program e.g. in swim or skate lessons. One to one on a more flexible basis - A volunteer can assist a person to access various North Vancouver Recreation & Culture services e.g. using the fitness centre. Assist with accessing equipment – adjusting weights, reaching for equipment etc. What are volunteers unable to do? Assist with personal care needs – showering, changing etc. Administer medication Give fitness advice, training tips etc. For more information on how to attain a one to one support volunteer, contact Meh Najak at 604- 983-6345. Visit our Volunteer page for more information on becoming a volunteer.